There’s no question that measuring the value of PR is one of a communicator’s biggest challenges. Whether you’re charged with handling your brand’s media relations, social media campaigns or both, a pointed question from the C-suite lingers: “How does this tie to our bottom line?” At the Measurement Conference later this week, experts will explain how to get senior leaders to see the value of your PR efforts. Here are some tips to get you started. 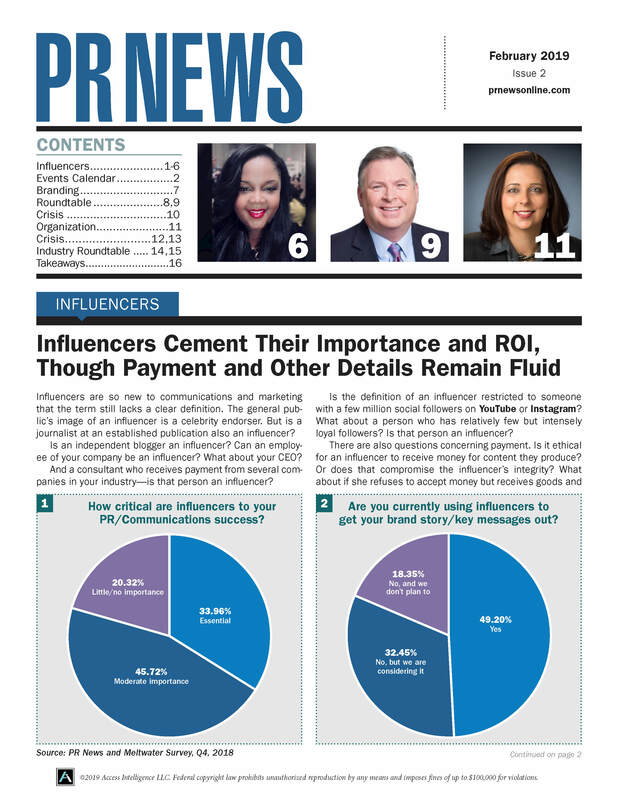 To better serve the community, PRNEWS parent, Access Intelligence, brought together what had been separate operating groups. With this restructuring, Diane Schwartz, the longtime leader of PRNEWS and senior vice president of the Access Intelligence Media Group, departed the company after 23 years. When she came aboard, PRNEWS was just a weekly newsletter. It’s an unfortunate reality that some C-suite executives are either unaware or unconvinced of how communications and PR are providing value to their business, which can lead to slashed budgets and high turnover rates. Proving PR’s worth to the C-suite is one of the most hotly anticipated sessions at PRNEWS’ upcoming Measurement Conference April 17-18 in Washington, D.C. Here are six steps you can take to show PR’s value in a way that your company’s leadership will understand. Mark Zuckerberg’s op-ed in the Washington Post made a strong call for social media regulation in four areas—harmful content, election integrity, privacy and data portability. But while vape maker JUUL got ahead of regulation in a smart way, the same PR tactic fell flat for Facebook. Here’s why. PRNEWS asks movers and shakers in the PR and communications industry to share a little bit of their personal history and personality through answering a series of 10 questions. Most measurement initiatives proceed in three stages. First, you need to define your business goals, then you need to determine the key performance indicators that align with them. And then comes perhaps the most important, and difficult, part: Communicating the outcomes to senior leaders in language they understand and tied to the goals they are prioritizing. Here are some sample KPIs linked to three business goals popular with the C-suite. This is the first installment of a feature in which PR News will ask movers and shakers in the industry to share a little bit of their personal history and personality through answering a series of 10 questions. Last week Buzzfeed announced that it would lay off 15 percent of its staff—including 43 journalists in its news division, and the announcement hit newswires as a troubling bellwether for digital publishing. The company, which first rose to fame for its viral listicles before later earning legitimacy as a journalistic enterprise, was initially quiet about one detail that was blasted by negative news headlines, tweets, and a protest letter by 400 current and past employees: it would not pay out earned PTO as a part of its severance packages. If you’re a Page manager for your brand, and you’ve got a new tab to the right of “Insights” on your dashboard, you’re in trouble. Facebook’s new “Page Quality” tab will appear “when we remove certain content that goes against our Community Standards and when we reduce the distribution of posts that have been rated false by a third-party fact-checker,” the social giant said in a news release. Additionally, the network updated its recidivism policy to combat the practice of users creating duplicate pages to continue to promote banned content.